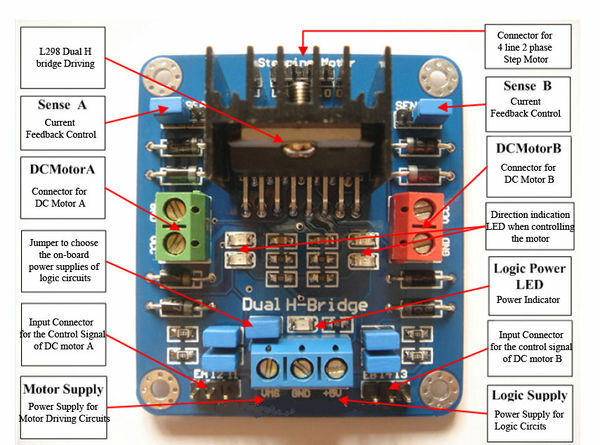 Click the button below to add the DC Motor Driver Breakout (L298 Chipset) to your wish list. This LinkSprite DC motor driver board uses one L298N, and can control two motors. The LinkSprite DC motor driver uses L298N as the driver chip. A 7805 is added to the boardas the power supply of the logic circuit portion. Jumper P4 can be used to determine if 7805 is used or not. There are also optional pull-up resistors to used for the MCUs of weak output driving capability. Diodes are added to prevent the reverse output of DC motor that hurts L298N. VMS is the power supply of the driving circuit. +5V is the power supply of the logic circuit. VCC is the driving pin of the motor. EA and EB are the two enabling pins of the dual-H bridges. PWM control, I2, I1, I4 and I3 are used to control the direction of the DC motors.